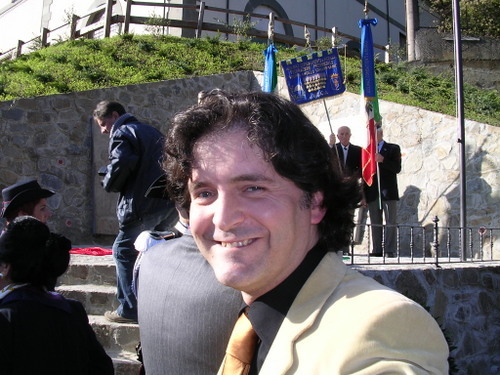 There are four reasons for visiting nearby Borgo a Mozzano’s square (Piazza Marconi) in front of its railway station. The first reason is the obvious one of catching a train from there. 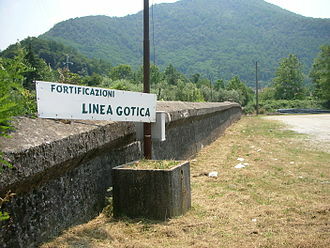 (But be warned, not all trains that stop at Bagni di Lucca’s Fornoli station stop at Borgo!). The second reason is contained in the station itself. It houses the’ Museo Della Memoria’ opened in April 2012. 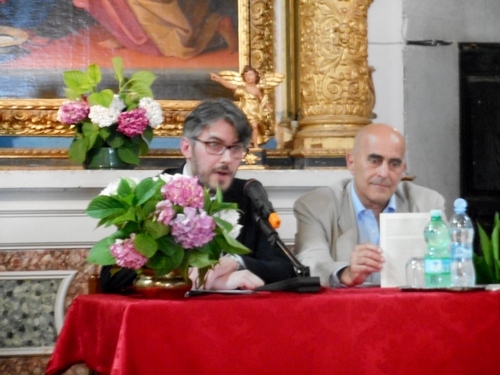 The initiative is one of the objectives that the ‘Committee for the Recovery and Enhancement of the Gothic Line’, which passed through Borgo a Mozzano, had when it was established. The museum contains photographs and oral testimonies of those who lived through the dramatic and terrible moments of the last war. 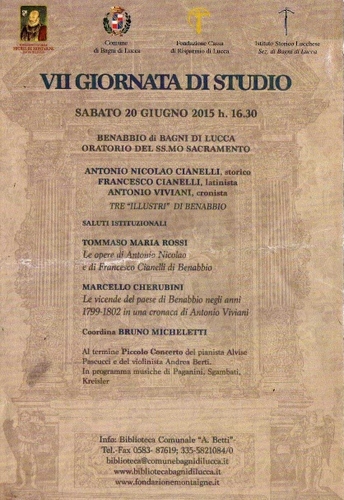 It holds relics, posters of the period and contemporary documents (e.g. warnings to those who broke the Nazi curfew i.e. execution). It’s ironic that at this very moment walls are being rebuilt throughout Europe, the latest being across the Brenner Pass, to ‘protect’ Europe against the millions of immigrants expected this summer. Where have the banners of ‘we welcome refugees’ disappeared to, I wonder? Incidentally, the old station building is also HQ for the local Ferrari owners’ club and the Alpini soldiers’ section. Indeed, there are further military connections in this square for the third reason for stopping at Piazza Marconi is to admire the war memorial. The original statue of the soldier was, in fact, melted down for the war effort. The present ‘Fante Glorioso’ was sculpted by local artist Gilberto Malerbi who also did the fine statue to Salvo d’Aquisto at Bagni di Lucca. The fourth reason is to read the inscription on the stone which is placed in a well-kept garden in the centre of the square. 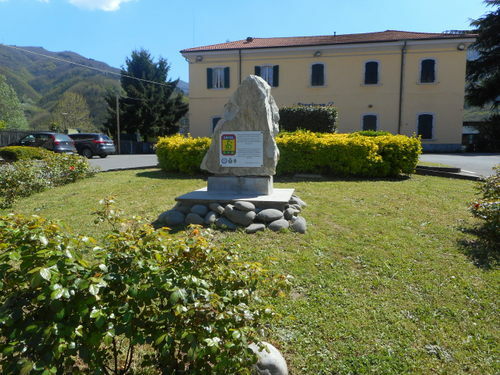 It’s dedicated to the Brazilian regiment which, together with the US Buffalo soldiers, were part of the allied force which liberated Borgo a Mozzano from Nazi oppression at the end of 1944. It’s not often realised that Brazil entered the war on the allied side in 1942 when its shipping began to be attacked by German U-Boats. 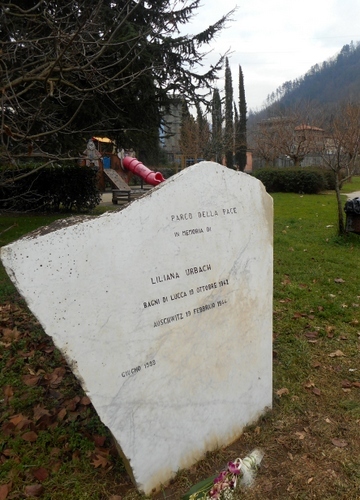 In 1944 Brazil contributed 25,000 soldiers to the allied war effort in North Africa and then in Italy where, in the Valle del Serchio, it also liberated Gallicano and Barga from the Nazi hordes. It lost close to 1,000 soldiers in combat. 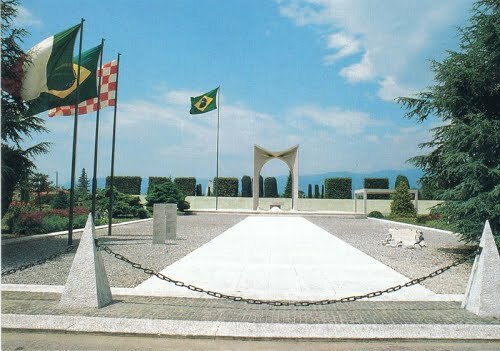 If you go to Pistoia you will see another memorial to the brave Brazilians, designed by Olavo Redig de Camposa, fellow architect to Niemeyer who planned Brazil’s capital,Brazilia. There are a further three monuments to the F. E. B. 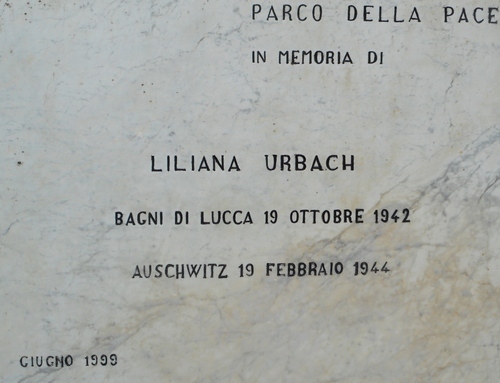 (which was the only South American country to participate in WWII) in Northern Italy. Translated, the inscription on the stone (which is also written in Brazilian Portuguese) reads “On 29th September the Brazilian expeditionary forces (F. E. B.) entered into Borgo a Mozzano. This plaque is placed in eternal memory and recognition of the contribution of the F. E. B. towards the fight for liberation from Nazi occupation and the re-establishment of liberty and democracy. 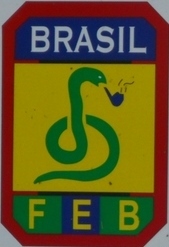 You may be wondering why the Brazilian Expeditionary Force emblem is a pipe-smoking snake. That’s because in the early part of WWII Brazilian politicans used to say that Brazil had as much chance of joining in on the allied side as one seeing a snake smoke a pipe. It’s like our ‘pigs can fly!’ The F. E. B. proved them wrong and, to mock the saying, reversed its meaning and used it as their emblem. Indeed, the Brazilian soldiers were known as the Smoking Snakes! So next time you’re at Borgo a Mozzano railway station don’t just gaze at the train timetable and wait. Have a little look around you. There’s more than meets the eye! Salvo d’Acquisto was a carabiniere who, aged just 22, sacrificed his own life to save those of his comrades on September 23rd 1943 during World War II. Salvo joined the carabinieri in 1942. At Torre di Palidoro, a place on the Lazio coast, there occurred an explosion in a munitions dump causing the death of two German soldiers. The explosion was actually triggered by an improper storage of dynamite and was not a pre-meditated action. Field-Marshal Kesselring, using his powers as governor of Italy, remained convinced, however, that the explosion was caused by a resistance group and ordered an investigation which failed to find anyone responsible for the act. 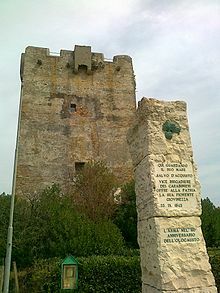 He therefore, rounded up twenty-two men who were marched near the Palidoro tower and ordered to dig a common grave in which they would be thrown after their execution. True to the word ‘decimation’, whereby, for every German soldier killed, ten Italians would pay with their lives, Kesselring was adamant about their fate. 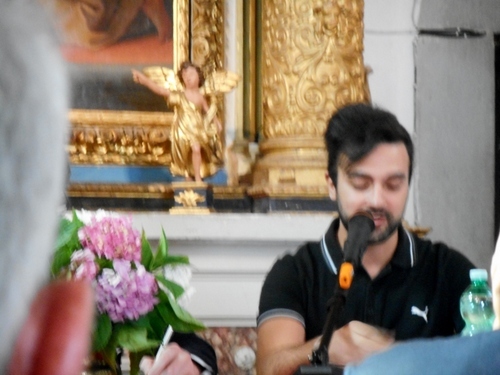 However, the twenty-two year old Salvo d’Acquisto spoke, through an interpreter, with the commander in charge of carrying out the executions. Salvo declared that he was the only one responsible for the explosion and that the twenty-two men should be set free as they had nothing to do with the incident. This was clearly a white lie but what a lie to save the lives of twenty-two other innocent men! Those twenty-two were released and witnessed Salvo stand unflinchingly to attention to receive his executors’ bullets. “Long Live Italy”, he shouted and then collapsed lifeless on the soil to be thrown in the pit originally dug to accommodate twenty-two bodies. Since his death Salvo d’Acquisto has been all but apotheosised as a hero of self-sacrifice and a supreme example of altruism. 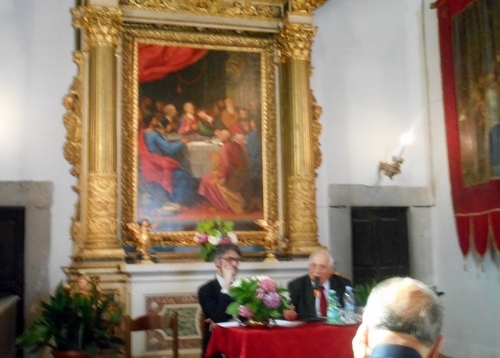 Throughout Italy roads and piazzas have been named after him, carabinieri stations and barracks have been named in his honour and films made about his life. 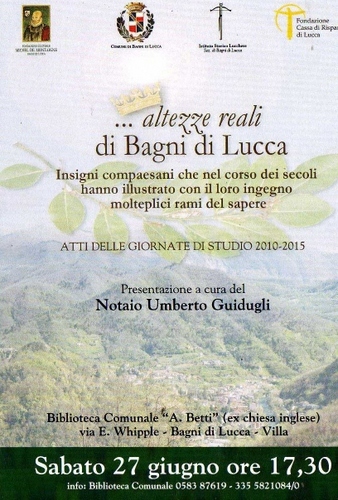 Bagni di Lucca, too, celebrated Salvo d’Acquisto on 12th November 2005. A local sculptor, Gilberto Malerbi, cast a bronze statue of Salvo which can be seen to this day at the corner of the Contessa Casalini gardens. 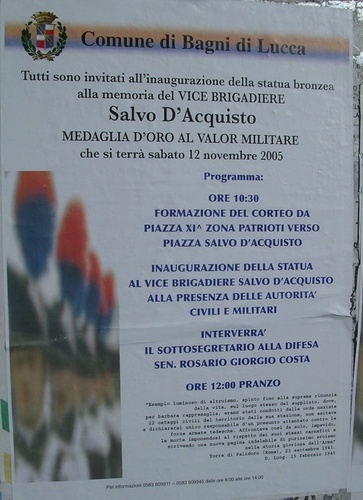 A military parade, the largest of its kind ever held in Bagni to this day, including Carabinieri on horseback (the carabinieri are a branch of the military and not police, as in the UK), Bersaglieri with their capercaillie-feathered hats and a host of dignitaries from near and far, graced the day with the splendour of their uniforms. 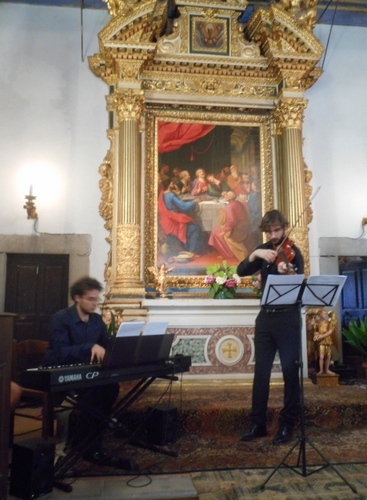 Speeches were made and bands played. It’s important to realise the role of carabinieri as peace-keepers in the troubled zones of the Middle East and, especially, to remember the terrible incident at Nasiriya Iraq on 12th November 2003 when 19 of them were killed when a truck load with ammunition drove into their barracks. I’m quite sure that in the present climate of fear and uncertainty that has descended over Italy (as it has in the majority of European countries) we can be in no doubt that the carabinieri will help the country in ensuring that we can still lead our daily lives with increased protection from the terrorist threat.